Aerialist Performances In Church? Creative Worship May Have Gone Too Far! Fog, Lights & Aerialist Performances! Some Think This Church Took Creative Worship Too Far! 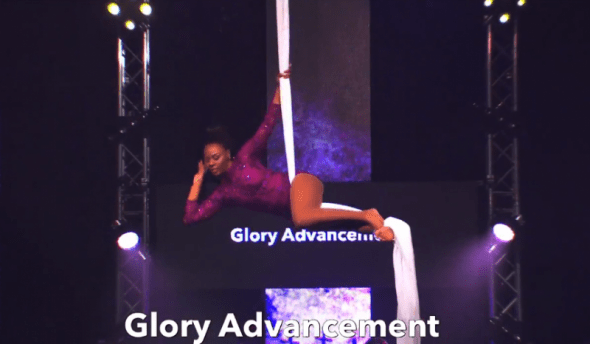 An aerialist glorifies God with her body at the Embassy Church International in Atlanta, Georgia on April 6, 2018. Fog, concert lights, prophetic paintings and aerialist performances are all parts of the creative worship at Embassy Church International in Atlanta. Worship for the church has gone beyond the traditional liturgy, to using high level of creative technology for worship. The question however is this. Is the church taking it too far? The primary aim has said by Ajani Brown, Embassy Church International’s pastor of operations, is to help usher churchgoers into “incredible” encounters with God. Embassy Church International began in a living room with just 12 people five years ago. They were mostly college graduates hailing from different Christian traditions. For almost two years, that fellowship was stuck at just 11 people. It eventually grew to 30 people “and all we did was worship,” Brown explained. Since the introduction of creative technology to worship services, like concert lights and fog, weekly attendance at Embassy Church International has mushroomed to approximately 400. “For a long time we did not have fog in our services. We did not have lights in our services. We had great content. We had the music, we had the songs, we had the liturgy. We had all of that. What lighting, what fog did was it helped bring the worshiper into a context of what was happening. It helped make sense of what was occurring because they (millennial Christians) are visual learners,” said Brown. While researches have shown that innovative worship service is the way to help improve the declining numbers of worshippers in the united state, and the pastors of Embassy Church International in Atlanta have fostered the same ideology, not everyone is in agreement. When Apostle Bryan Meadows, Embassy Church’s lead pastor, announced plans in April to make aerialist performances a regular feature at the church’s worship service, Ann Brock, a longtime blogger on issues in the black church, said it was a step too far. Approximately two weeks before he announced his decision to resign as lead pastor of Quest Church in Seattle on June 3, Eugene Cho also publicly lamented on Twitter what he feels is a growing overreliance on technology in worship services. “I’m convinced that in the Church today, we need less spotlights, fog machines, formulas and simply more humility and dependence on the presence and power of the Holy Spirit,” Cho tweeted. Harry L. Reeder III, senior pastor of Briarwood Presbyterian Church in Birmingham, also knocked what he sees as the growing “entertainment dynamic” in a YellowHammer interview. “…We introduce all of these things which, actually, I have no issue with in, let’s say, an outreach event or a concert or something like that. However, worship is something different. Worship is something unique and wholly other,” he argued.